I didn't know my paternal grandfather, as he died many years before I was born. He was born June 4, 1870 in Almond, New York and died September 4, 1927 in South Dakota. Frank was a farmer, as were his father and grandfather. Land was expensive and the desire for a farm of his own brought him to South Dakota. In May, 1910 he and his brother-in-law Julian came to South Dakota (from Minnesota) by train. They each filed on homesteads east of Provo. Their families came on the train to Provo on November 1, 1910. Frank met his family with a team and wagon. There were no roads, just trails to follow. The family arrived at their new home, a sixteen foot by twenty-four foot, two-room, tar paper shack. There was no insulation, electricity, or plumbing. It was all wonderment for five small children: Theodore (7 years), Sadie (6 years), Edward (5 years), Arthur (3 years), and Charles (1 year). The family kept warm with coal and wood. Coal was used in lamps. The groceries were bought at the little grocery store in Provo. Henry Kramer, known as Mr. Germany, was owner of the store. He also tested cream brought in by the rural people and sold their eggs. These things helped a great deal when buying groceries. Customers were given a sack of candy when the grocery bill was paid. Frank and his wife (Annie) milked a number of cows and sold the cream. Of course, the children drank a lot of milk. If it hadn't been for the cream checks, times would have been a lot tougher. Frank worked on the section (railroad) at Provo during slack time at the farm. Sometimes he walked the four miles to Provo, stayed there during the week in a box car with the other railroad employees, and then walked home for the weekend. 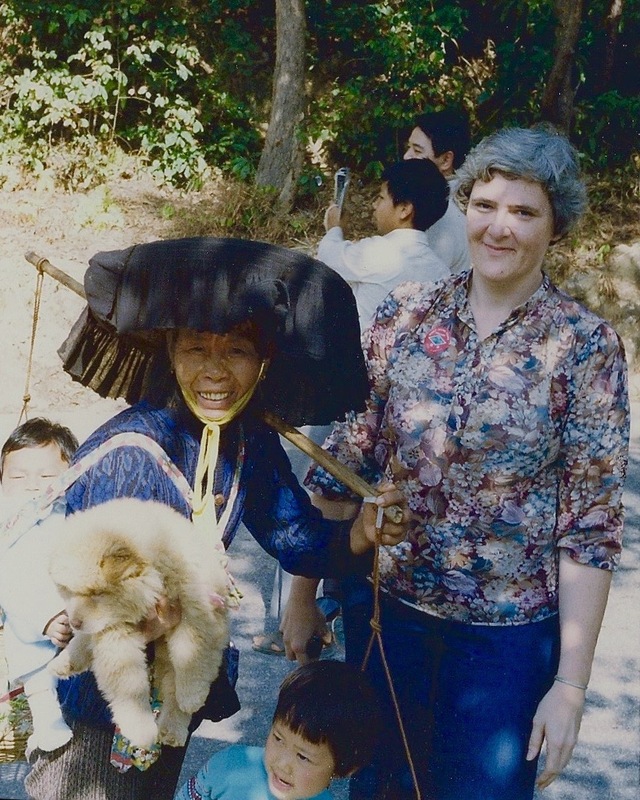 When the children were young, Frank contacted walking typhoid fever. They thought his sickness came from drinking from a water hole. He was delirious in the middle of the night, so Annie and the children walked to the neighbors for help. During that time, Frank left home and couldn't be found. The next morning people were out looking for him. He was found miles from home near Cascade (approximately 20 miles), and the sheriff put him in jail at Hot Springs. Dr. Hargens went to the jail to examine him and convinced the sheriff that Frank was sick, not crazy. He was in the hospital several weeks, and his first concern when he recovered was if the children were okay. Annie went to Hot Springs to see him a few times, but travel was not easy then. For her to get to Hot Springs, someone would take her to the train in Provo to go to Edgemont. She walked about five blocks to her sister, Ada's place and stayed overnight. The next morning she walked back to the train depot to catch the train to Hot Springs, spent as much time at the hospital as she could , and in the afternoon, returned to the Hot Springs depot to catch the train back to Edgemont. She stayed there overnight and caught the train back to Provo the next day. With five little children, and cows to milk, this journey was not easy. All farm work was done with horses. It was the boys' job to walk along and keep the horses going. A walking plow was used. 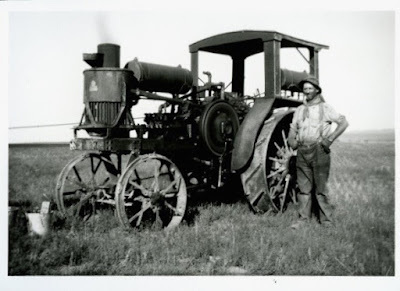 Frank unloaded an Avery threshing machine, tractor, and gasoline tank from a railroad flatcar on September 17, 1922. (note photo above) A platform had to be build so the equipment could be removed from the flatcar. Frank threshed for others in the Provo and Edgemont areas with the older boys helping him. 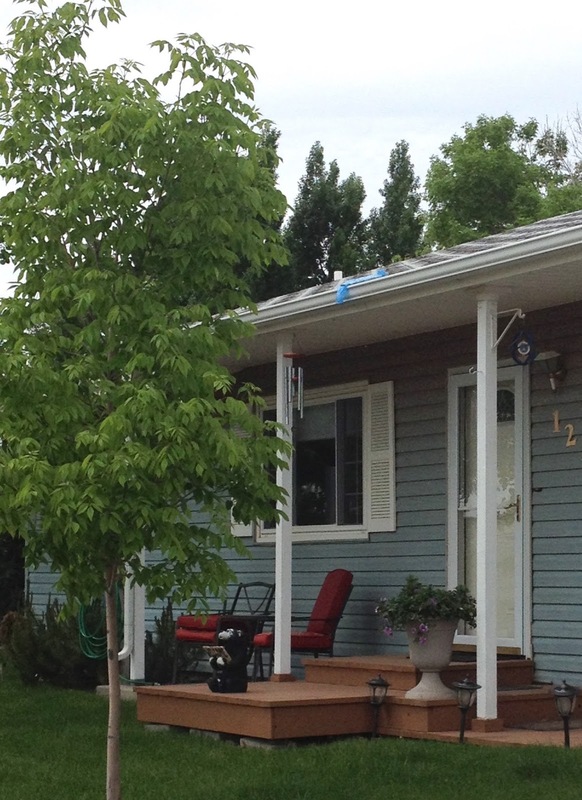 Frank joined the Home Guard in Edgemont. He would walk the eight or nine miles to Edgemont, and after the drill, walk home. He was a hard worker and a good provider. He would help anyone in trouble. Frank passed away on September 4, 1927 at the age of fifty-seven from bleeding ulcers. His wife, Annie passed away January 7, 1950 at the age of eighty-two. 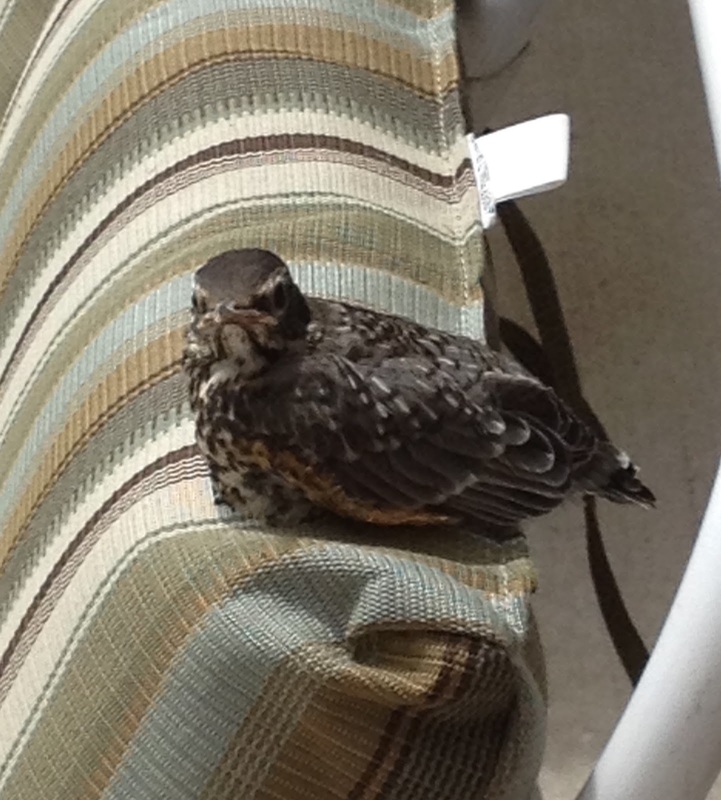 Last week, this baby Robin gave me the evil eye when I went out to water my geraniums. 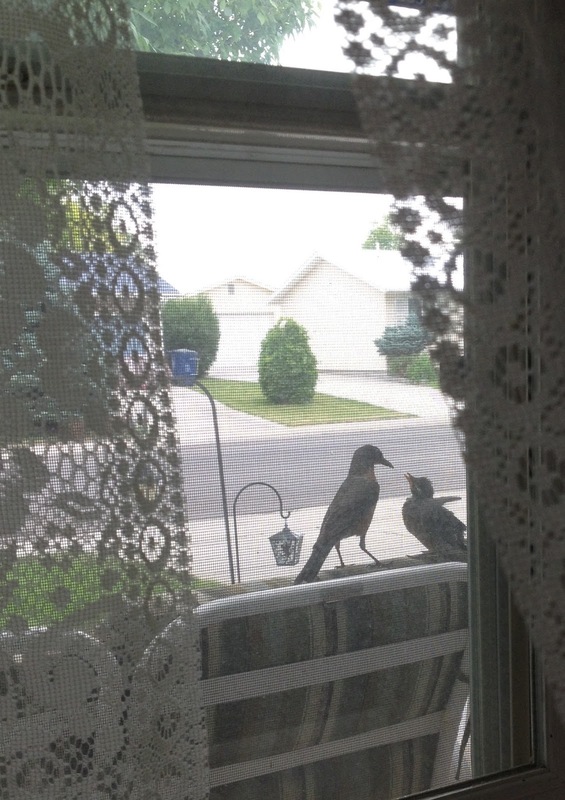 It wasn't a surprise to see him/her there because the glider outside my front door has been a popular perch for baby robins in the past. Some of you may remember my photo of the Brothers Grim in 2011. The baby tolerated my comings and goings but the Mama Robin was making a big fuss on the roof. What surprised me later was seeing (through the window) the actual exchange of food. 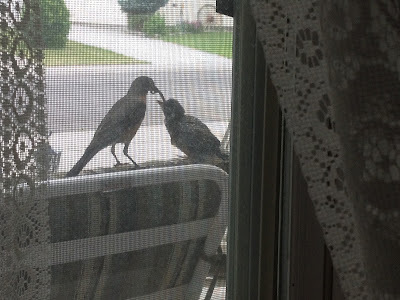 The window screen certainly shows up in the photos, but I couldn't resist sharing the images. What did I tell you about talking to strangers! Later in the day, a sibling joined this little one. They stayed for the day and received multiple feedings, but I haven't seen them since; perhaps, they have now learned to fend for themselves. 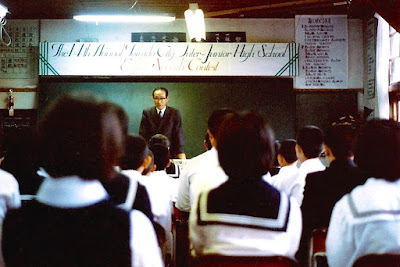 The local Japanese school hosted an annual English speech contest where the students recited memorized passages in English to a panel of judges. I was invited to judge the first year that I was in Japan. The contest was an opportunity to see the inside of a Japanese school, and I was delighted to accept the offer. Note the various uniforms the students are wearing, the green chalk board and the posters on the wall. These students attended school six days a week. 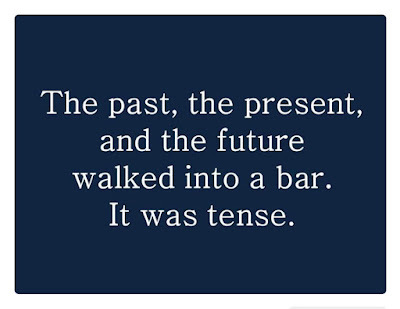 A little chuckle for you today. . . 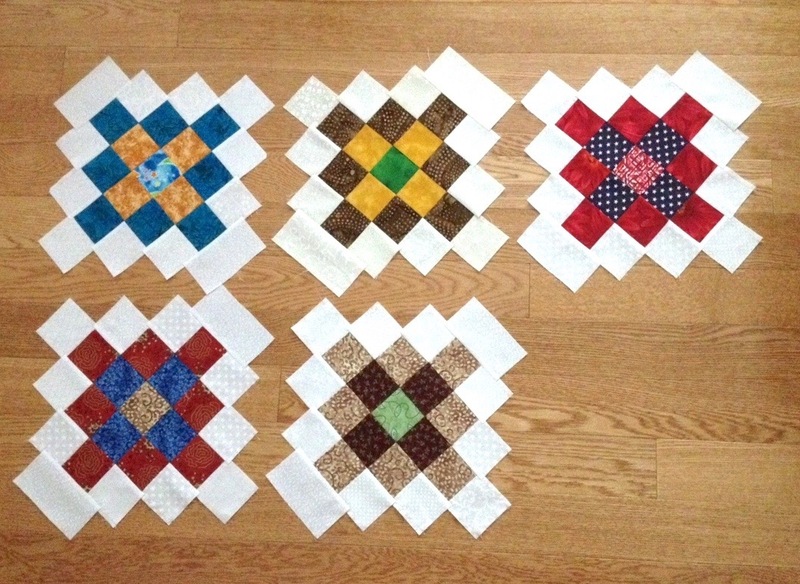 In addition to the initial Granny Square block (top middle) I managed to make four more blocks out of the scrap bin. 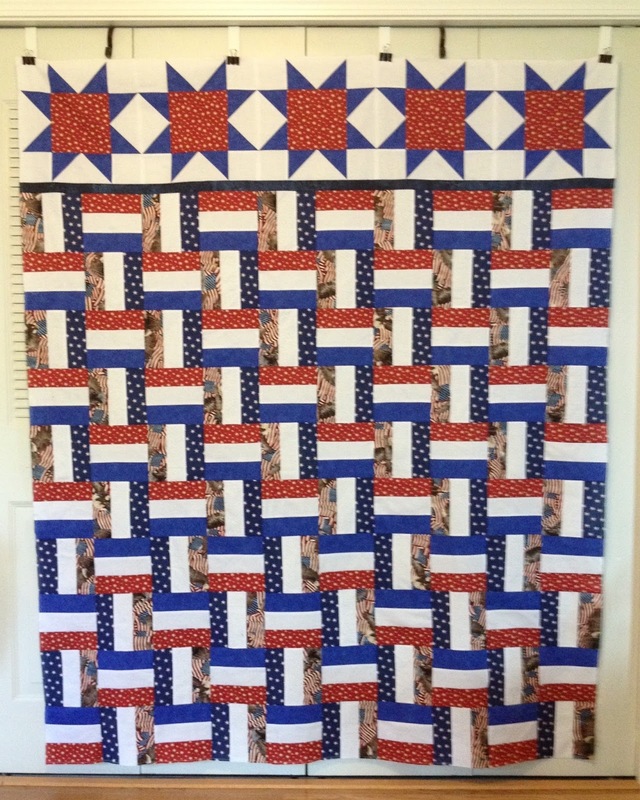 I've been cutting and prepping fabric to make more of these addictive blocks, so the scrap bin should provide enough fabric to make blocks for another Quilt of Valor. For non-quilters, the blocks look shaggy, but they will be trimmed when I am ready to sew them together. The trimmed blocks will have a lot of bias edges that are prone to stretching when handled; thus, to reduce the stretching, the blocks will be trimmed later. 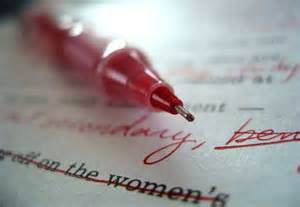 It would be interesting to know how many red pens (also orange and purple) I used over my 33 year teaching career: I'm sure my former students will tell you that I practically "bled" on their papers. 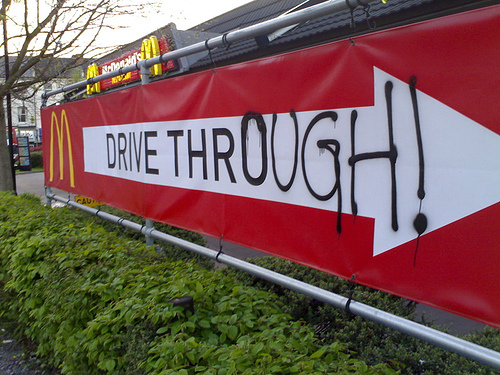 That statement would be somewhat true, but only if they did not spend adequate time proofreading their work. This cartoon brings back memories of grading research papers that I would just as soon forget. 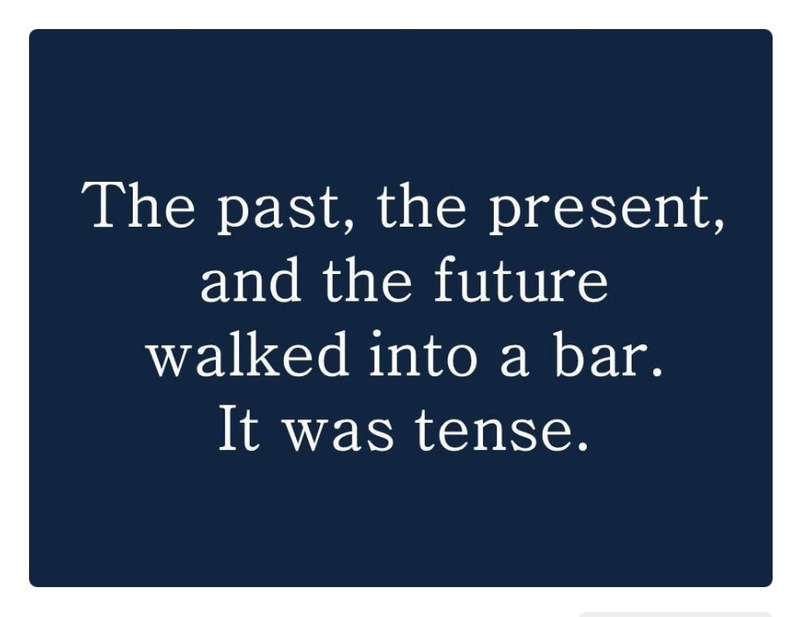 The last two years I was in the classroom, my students spent the first ten minutes of each class working on MUG (M = mechanics, U = usage, and G = grammar) shots. They worked in groups to find and correct errors on writing samples, and I was amazed how much their own papers improved after working on MUG shots for a quarter. 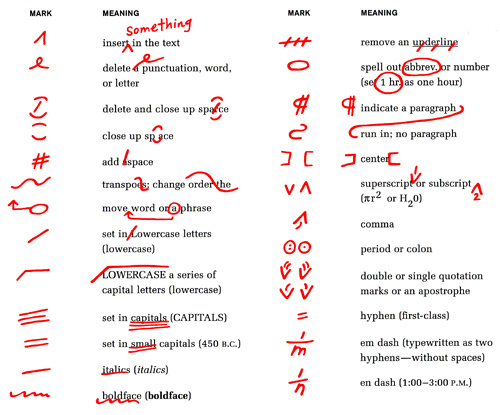 My red pen usage decreased considerably. 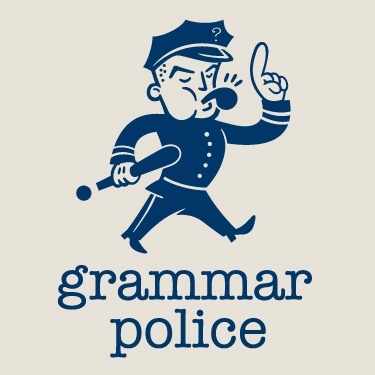 The Grammar Police is on patrol. . . 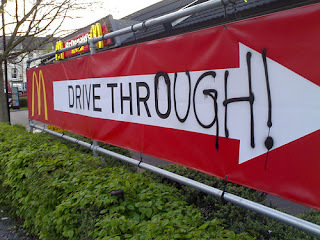 Even though I see grammar and spelling errors constantly, I am not tempted to pull out my red pen or spray paint and make corrections: those days are behind me; however, I chuckle when someone else has not resisted the urge. 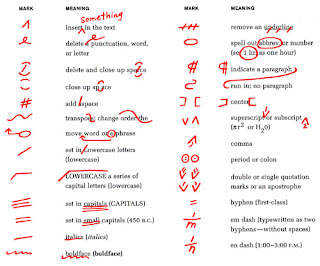 Do you have red pen flashbacks? I've been trimming, cutting, and squaring scraps to make the Granny Square blocks, and the scrap piles don't seem to get any smaller. That bin in the upper right is filled with 2.5 inch strips leftover from other projects. 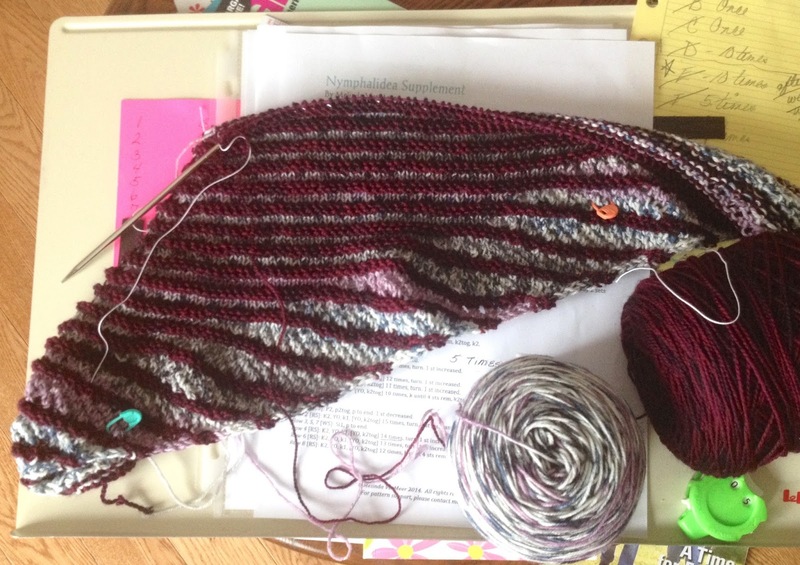 The string strips in the upper left are waiting for additional strips to be made before becoming a project. Scrappy quilts require a lot of prep work! 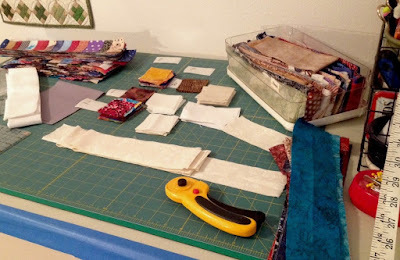 Before I begin cutting into any new fabric, I MUST bring my scraps under control - again! 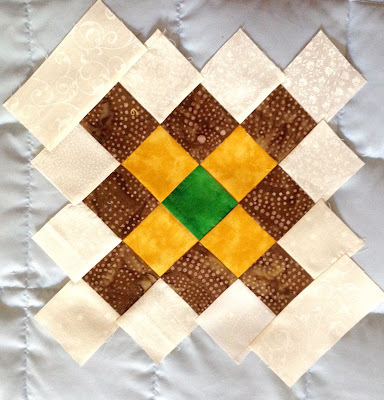 I've been admiring Lori's Album (granny square) blocks for a long time (her nearly finished quilt can be seen here), and when she posted that she was making more blocks, I decided it was time to get some scraps under control, using this block pattern. 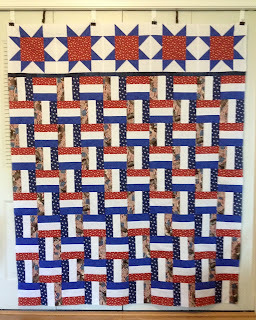 While the directions that Lori used are no longer available online, I did find this source that shows two techniques (scraps and strips) to make the blocks as well as setting ideas. Lori's blocks have another round of colored squares, and I didn't notice until I had several blocks made. Drat! 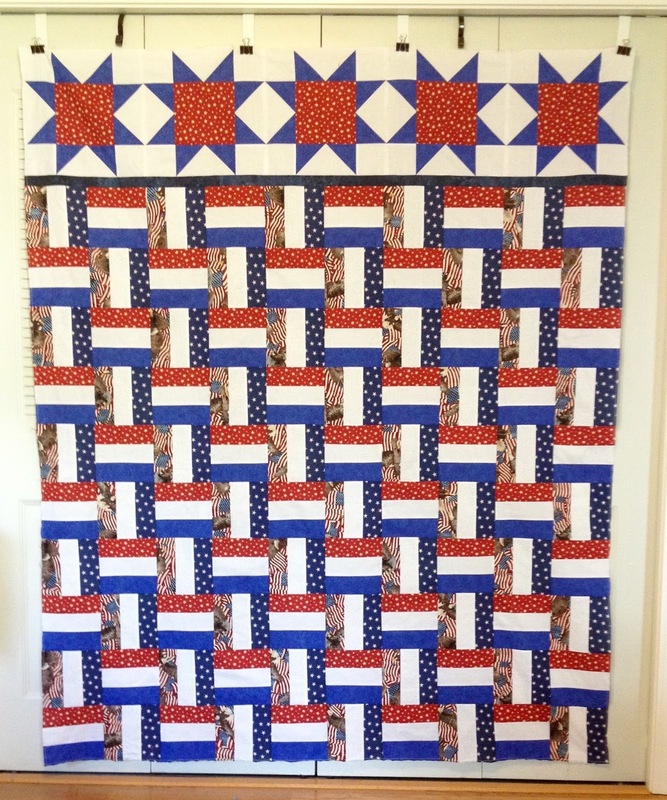 I've decided to continue making them like the one pictured until I have enough for a quilt. The blocks for the next quilt will have the 16 squares, like Lori's blocks. Before heading to the mountains for a family camping reunion, everyone gathered at my house for the "basket signing." Seven Longaberger picnic baskets were purchased (one for each family), and Marilyn made the cheerful fabric liners out of fabric printed with large ants. Everyone signed their name and birth date on the underside of the lid with a permanent marker. A brass plate with 1999 Stearns Reunion was adhered to the top of the lids (directly under Sis' hand). 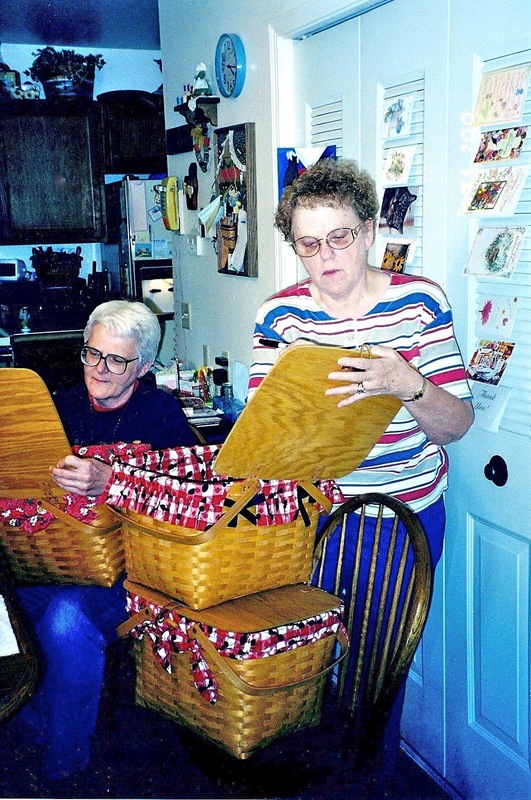 The baskets were not only a memento of the reunion but also a source of some family history. Another posts about the camping trip can be seen here. 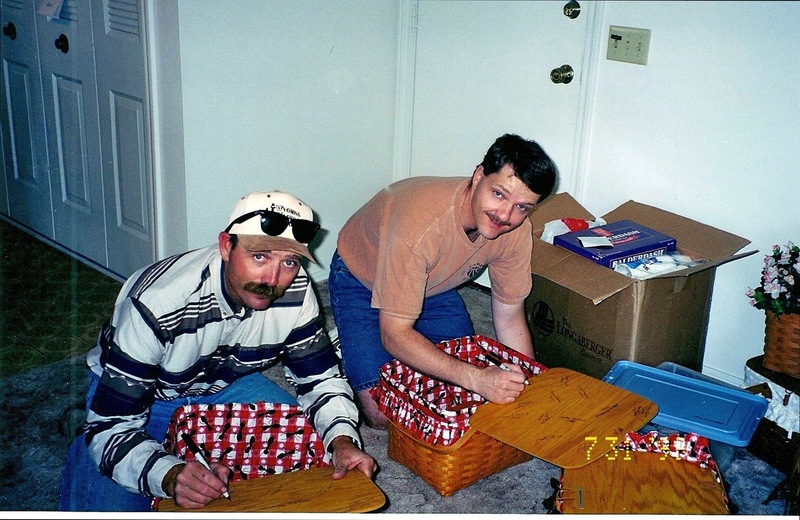 We gathered for a two family reunion (my sisters married brothers, so it was only logical to gather both sides of the family) in 2006 in Park Rapids, MN - at that gathering, everyone signed fabric blocks for a quilt. 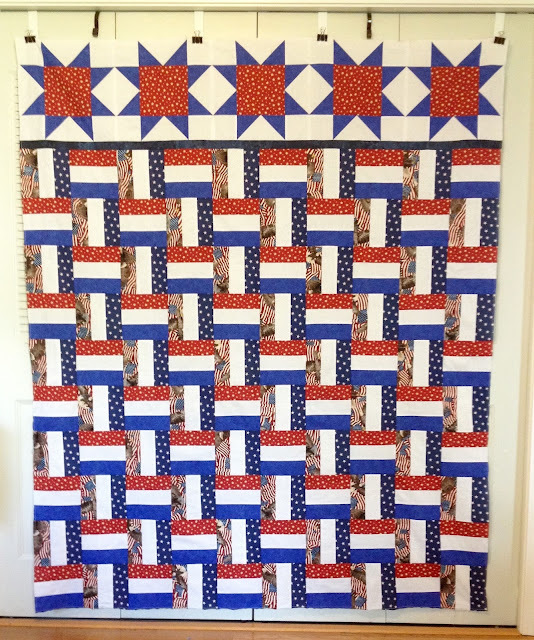 The quilt I made can be seen here. Does your family gather periodically for a family reunion? 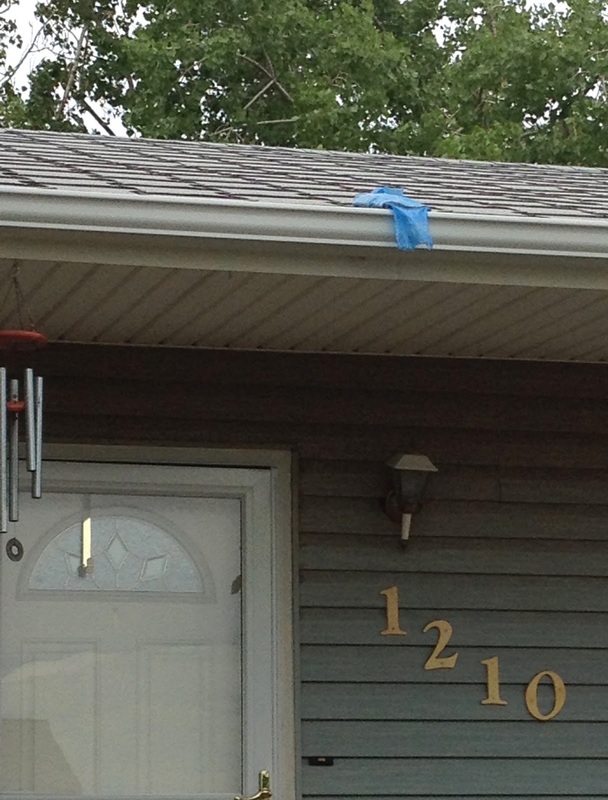 It appears that my neighbor's Riverton Ranger was delivered by drone or by a carrier who needs a bit more training. I subscribed to the Casper Star Tribune (the only published newspaper delivered state-wide) for about 10 years, but I battled with two/three carriers two years ago. 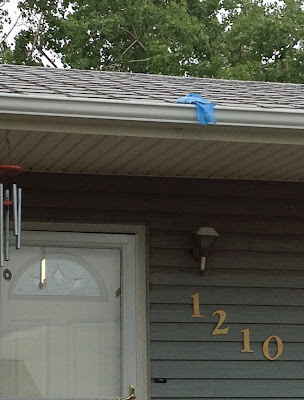 The carrier would drive up my short driveway at an angle to toss the paper on the front porch. The only problem was that he/she also drove on my lawn right where one of my underground sprinklers was located. I tried putting up a wire barrier with attached red reflectors, but the carrier just drove into and over the barrier. I tried a heavier barrier (1/2 inch thick metal frame), and it too was bent and broken. 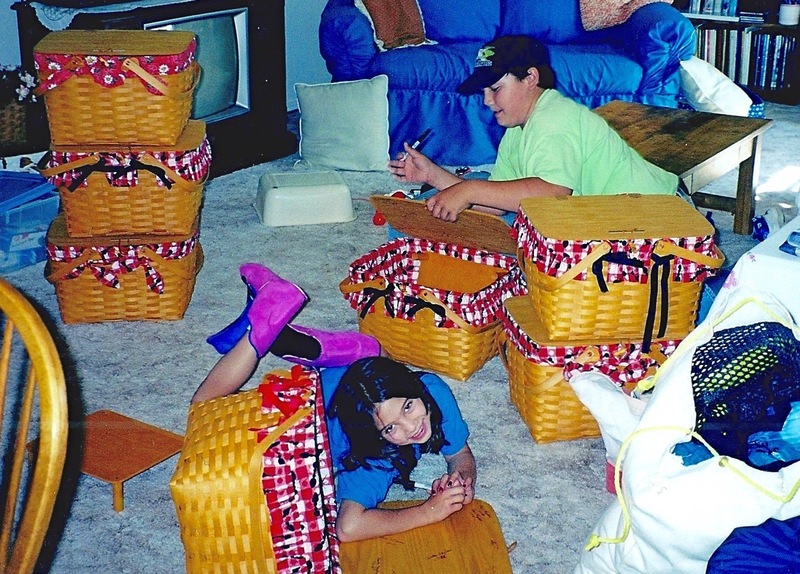 Other times, it was like a scavenger hunt to even find the paper. After numerous calls to the regional director, I gave up and just cancelled my subscription: it just wasn't worth the aggravation. Is your paper delivered by a reliable carrier or by drone? 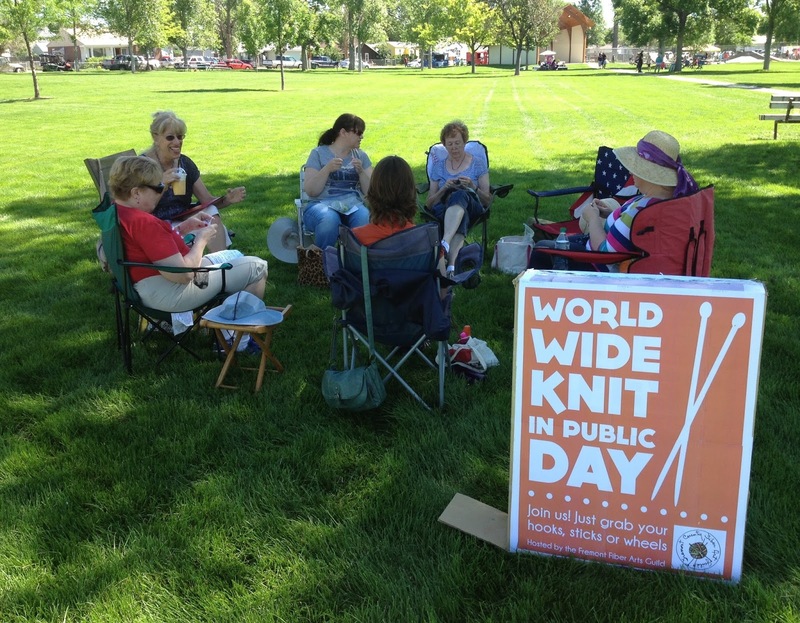 Mary H., Nancy J., Jane W., Jamie D., Colleen J., Christy P.
Members of the Fremont County Fiber Arts Guild held a Knit in Public event on Saturday: it was a gorgeous day to sit and knit with friends. Jamie (back to the camera in the center) made the sign that caught the eye of many passersby. Lion brand posted an interesting article on the importance of knitting in public. Did you plan to Knit in Public this week? Firecrackers (QOV #66) was created with the help of my QOV elves in the Lander Sew Sistas. Thank you Mary H., Nancy L., and Brenda H. for your help. Can you spot the problem in this photo? I had to rip and resew a section. Emma's cowl took me longer than anticipated to knit. I grew weary of the endless stockinette. 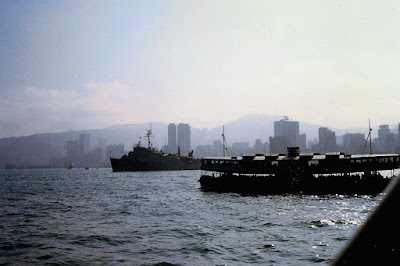 An earlier post can be seen here. 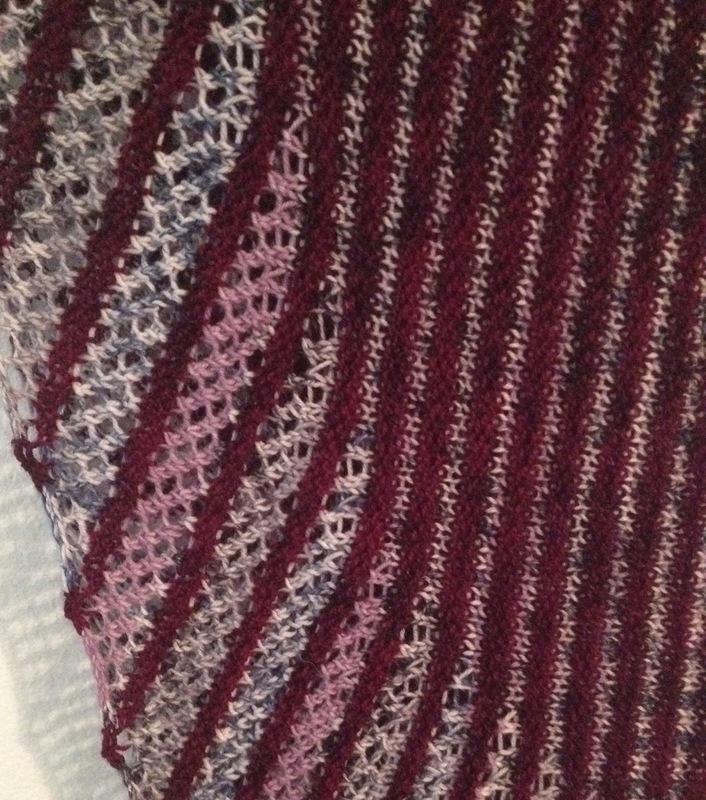 I saw a similar cowl on a Very Pink video, but the pattern was only available with a yarn purchase. Since I have a LOT of sock yarn in my stash, I did not want and need to purchase more. I watched the video multiple times to get the basic idea of the pattern and then improvised. Cast on 60 stitches with a provisional cast on. Knit in a solid color for 8 inches and begin transition into the next color by knitting three rounds of the new color and then three rounds of the first color. 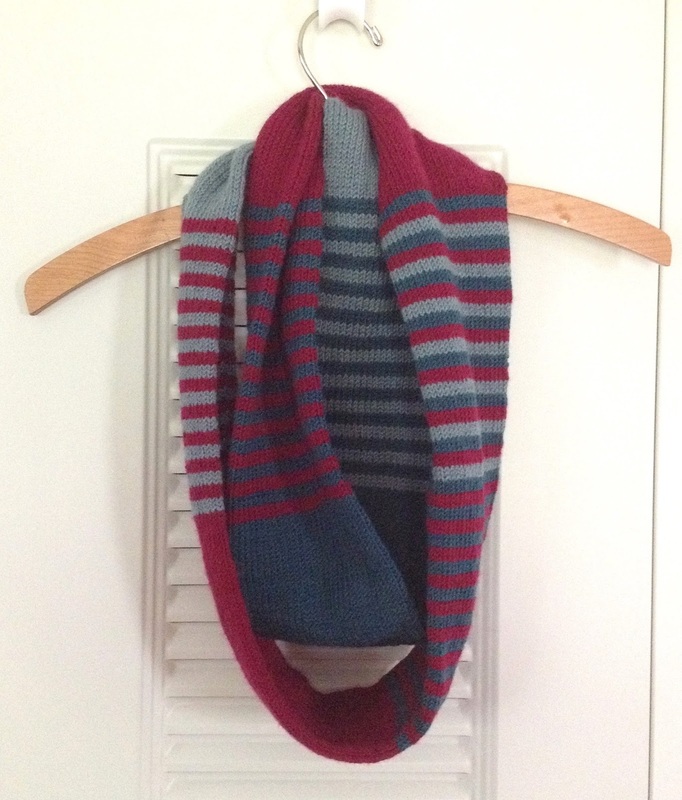 I knit 11 stripes of each color and then knit a solid section with the second color. 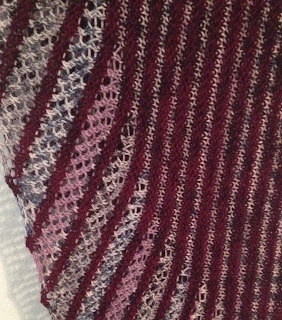 After eight inches of solid, I again transitioned to a third color alternating three rounds of the second and third color until I had 11 stripes of each. I continued in this manner until I had the length that I wanted. 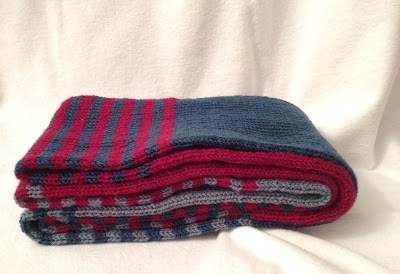 The last section I knit contained all three colors, three rounds each. I put the provisional edge stitches on a needle and used the kitchener stitch to graft the two ends together for a seamless join. 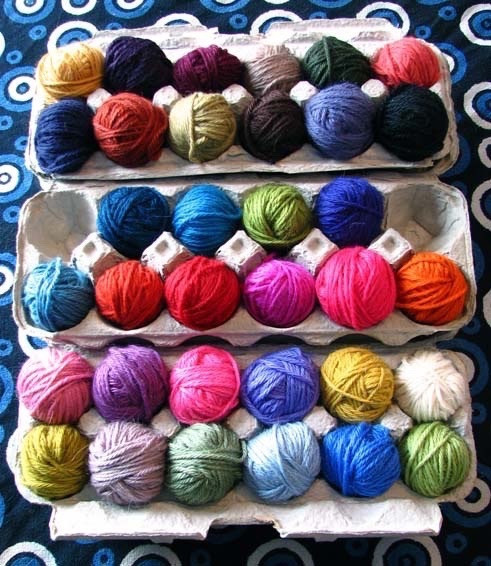 Isn't this a clever way to store small balls of scrap yarn? If holes were poked in the top of the carton, the yarn could be threaded through, and knitting with the small balls would be easy. 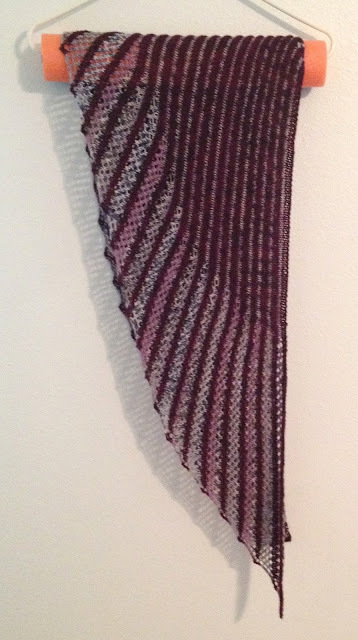 Brenda purchased yarn in Las Vegas for two Nymphalidea shawls, so I began the second shawl as soon as I finished the first one. 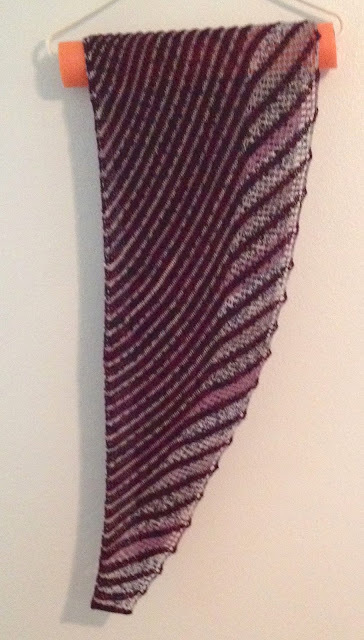 I was a little put off by the variegated yarn when I started, but since its a self-striping yarn, I decided to let it do its thing before asking Brenda if she wanted me to continue. When the other colors appeared, I was pleased with the look and continued knitting. 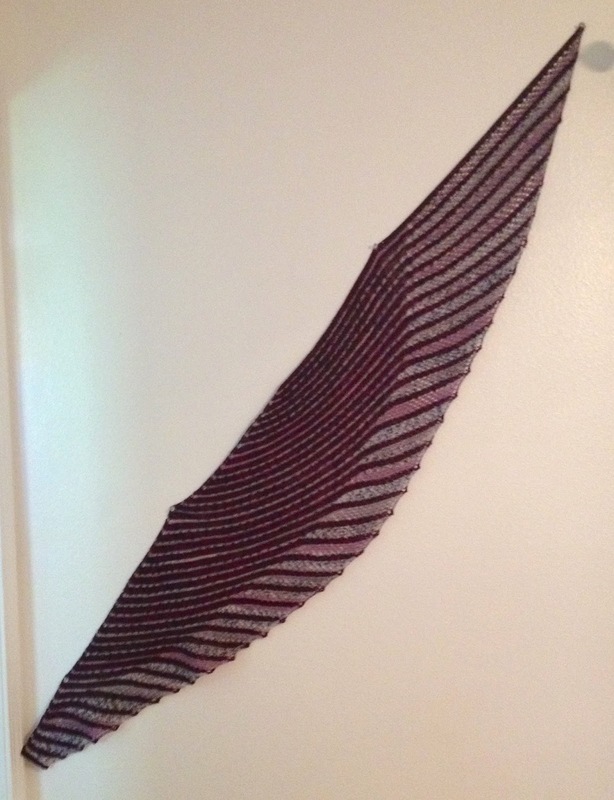 I pinned the shawl on the wall to show its true shape. I like knitting the pattern so much that I've selected some yarn from my stash to knit one for myself.